The Nike M2K Tekno draws inspiration from the Monarch franchise and pushes it into the future with space-age detailing. Its layered upper mimics the design of the original Monarch, while the chunky outsole draws on the beloved Monarch IV. THE MONARCH STEPS INTO THE FUTURE. Leather and textile upper draws inspiration from the Nike Air Monarch. Foam midsole provides lightweight cushioning. 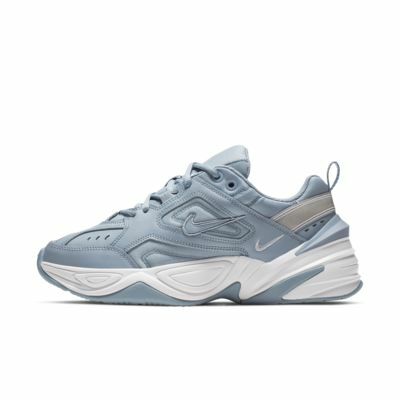 Nike Air Monarch IV outsole is distorted by the addition of a TPU heel clip for a futuristic look. Heel pull tab lets you get the shoe on and off easily. FIT TIP: For a closer fit, order a half size smaller than your normal shoe size. I absolutely love these shoes I'm almost always a 7 in sneakers and they fit perfectly. They are extremely comfortable and look very flattering on because they end up giving you some height.